Był to pierwszy tego rodzaju protest społeczności polonijnej w Sydney ponad wszelkiego rodzaju podziałami. Wiec rejestrowały media polonijne w tym Radio SBS, Polskie Radio Sydney, Expres Australijski i Bumerang Polski. Mimo czynionych prób, media nie zostały wpuszczone na salę walnego zebrania członków Klubu, gdzie zapadały ważne dla przyszłości tej polonijnej placówki w Sydney decyzje. Z nieoficjalnych informacji wiemy , że nie udało się zablokować ( stosunek głosów 139/135) wniosku zarządu o zmianę w statusie majątku Klubu, która umożliwi sprzedaż części posesji bez zgody walnego zebrania. Część członków Klubu uważa, że procedura głosowania była niezgodna z prawem, gdyż dopuszczono do niego niepełnoprawnych członków Klubu tzw. associate members. Historia jest jednak msciwa i zarazem sprzwiedliwa na swoj sposob,zatoczyla kolo i po latach wrocila do punktu wyjscia. O tym ,Czy decyzja podjeta na Walnym Zebraniu jest deyzja dobra, pokaze czas. It is really disappointing seeing in this video such a large group of fellow Polish folk being brain washed by a very loud minority group of Polish Doctors, Lawyers, Media and Business Owners with clear self interests of destroying the Polish Klub. These people have never contributed in any constructive way to the Klub, they are the main reason and cause of the endless fighting. We as a community should really question the agenda of this loud minority instead of turning on the only people that really want the Polish Klub to succeed. If you really believe in the Polish Klub then please educate yourself first instead of listening to the lies being spread by the loud minority that is responsible for creating the chaos we see in this video. We should be thanking and supporting the efforts of the current board of directors and the few volunteers working hard to keep OUR Polish Klub. The loud minority was responsible for spreading disinformation in the community, inciting violence and creating an unsafe environment in the Klub on the 19th March. Is this really the people we want to support? Majority of Polish community has been brain washed by this group into thinking that this was a vote to sell part of the Polish Klub. Before we as a club can decide what we can do with the burnt out building on 75 Norton street, it is a LEGAL requirement to have this property reclassified as NON-CORE. So please read your facts instead of believing the lies being spread. If we continue down this road of holding up this process there will be no more Polish Klub in a few years time. Volunteers, wonderful people. All is against their leader, Mr Borysiewicz, who presents as if all Polish Doctors, Lawyers, Media, Business Owners, and all people who disagree with him are "bad people". While he is the one who lies, disrespects, oppresses, and tries to sell ~60% of the largest polish heritage and wealth in Australia without considering the polish people's opinion! He breaks the law only to sale. A good guy? In best case an idiot who has no remorse for all the money he wasted, but is willing to spend more of Polonia's money only to protect his personal ego, or who knows why really.. It's a lot of money at stake. And for him all his unbelievable behaviour is just perfectly fine and those hundred of polish polish people (some with kids) singing the polish anthem (incl. 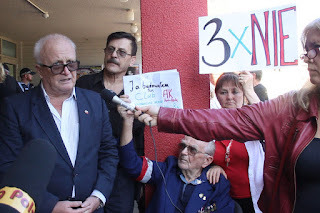 89 years AK veteran that built the club) he pushed and kicked out, are just a bunch of terrorist that have nothing else to do, probably, he would say, from laziness came only for fun to protest against him! Its so wrong! He is wrong and anti polish! BORYSIEWICZ OUT, the sooner the better for all Polonia! Let finally some reasonable people to run the club!